Just as there are hundreds of shapes, sizes and breeds of dogs, there are many variations in the color of their coats. Coat color affects more than appearance. The degree of coloration of his coat could possibly have an impact on a dog's likelihood of developing certain skin conditions. Variations in coat color result from the amount of pigment a dog produces, which is determined by genetics. Dark-colored dogs produce more pigment than lighter dogs; white coat color results from a complete lack of pigment production. Even dogs of the same breed can have wide variations in their coat colors depending on their genetic make-up. Chocolate, black, and yellow Labradors, for instance, are often all born in the same litter. Your dog can be affected by a variety of skin diseases, such as infections, immune-mediated processes and skin allergies. Although no evidence says dogs with lighter coat colors are more prone to any of these types of skin diseases when compared with dogs with darker coats, in one category color variation becomes important. A difference exists in the risk of developing skin cancer between light- and dark-coated dogs. Dogs with lighter coat colors experience more sun damage to their skin and therefore are at higher risk of developing skin cancers that result from sun exposure. In an interesting twist, dogs with dark coats are more at risk of developing melanoma, which is a tumor that arises from the cells that produce pigmentation. 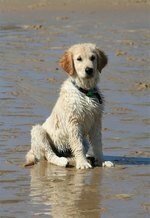 The three most common types of skin cancer in dogs that can develop from sun exposure include hemangiomas, hemangiosarcomas and squamous cell carcinomas. These tumors are most commonly diagnosed in dogs with light or white coats in areas where sun exposure is greatest. The most common locations are on the belly and inner thighs in dogs who like to "sunbathe" on their backs, and on the face around the nose and eyes. These tumors may appear as raised lumps or masses on the skin, as flat areas of discoloration, or similar to a blood blister. The behavior of these tumors can vary from benign to malignant. Have any suspicious lesions checked by your veterinarian. Although your particular dog's coat color may not make him more susceptible to certain skin conditions, have your veterinarian examine any abnormal areas of the coat, itchiness or other problems your dog may have related to his skin. If your dog is diagnosed with a suspected skin tumor, your veterinarian will make recommendations about treatment. If your dog develops a sun-related tumor or you have a furry friend with a light coat, your veterinarian may recommend preventative measures such as dog-friendly sunscreen, protective clothing or minimizing your pup's time outside during times when sun exposure is highest. About the Author Amanda Fulmer is a veterinarian in Greenville, S.C. who earned specialty certification in medical oncology in 2008. She received a veterinary degree and advanced oncology training from Louisiana State University. Her scientific research has been published in several professional veterinary journals. She also lectures around the country on various topics in her field.